The Honorable Wescott Wilkin was elected as the second, and sole, District Court Judge in 1864. Originally from the East Coast, Judge Wilkin studied the classics at Princeton and graduated from Yale Law School before entering private practice and serving as a Judge in Sullivan County, New York. Judge Wilkin moved his practice to Minnesota in 1856. 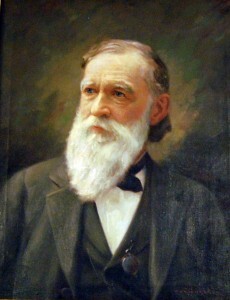 His imprint can still be felt in Minnesota, as he appointed the commission that purchased land in Saint Paul that eventually became Como Park. A world traveler, Judge Wilkin embarked on a world tour accompanied by Judge Flandreau that took him to Europe, Egypt, India, China, and Japan. Wilkin County is named after his brother, Colonel Alexander Wilkin.